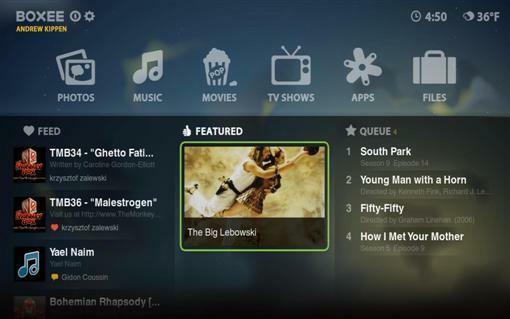 The free Boxee media aggregation software will soon have a hardware option. Boxee software installs on your PC and collects all of your DRM-free video and audio content, plus online content to be accessed in one interface. The hardware is a set-top box designed and built by D-Link and brings the same software to your television. Online services include YouTube, Comedy Central, and Netflix. Of course many other services are available, plus more will be added. The most interesting services to me are the academic lectures from Standford, Harvard and TED amongst others. Another feature that makes Boxee stand out from the competing streaming services is the social networking abilities which allows friends to share content and show each other what the other is viewing. You can even join video in progress with friends. The unusual-looking box includes WiFi, USB, SD card slot and an IR remote. Interestingly the only video output is HDMI, but there are Toslink and RCA stereo audio outputs. The set-top Boxee sells for approximately $200 and will be available in 2010.